Glass design has been a working field for specialists mainly, that where communicating in differing jargons mostly, but due to fact that modern technologies are building a bridge for more public applications, it seems practical to open the box for newcomers too and to define a technical convention to allow a proper definition of the work expected. TOPAZ is a concept that is inhereting most of the questions that should to be cleared before a project can start. Bitmap-files should show the highest original resolution possible to achieve the highest definition. 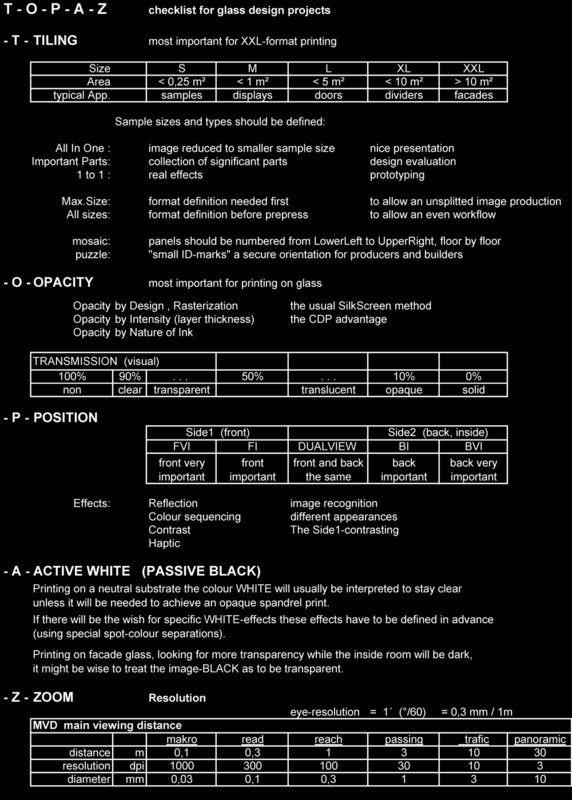 A technical orientation: 160 dpi for a 1 m wide print will deserve 1600 dpi in a 10 cm wide file.